My contribution to the New York Times Moment in Time project. 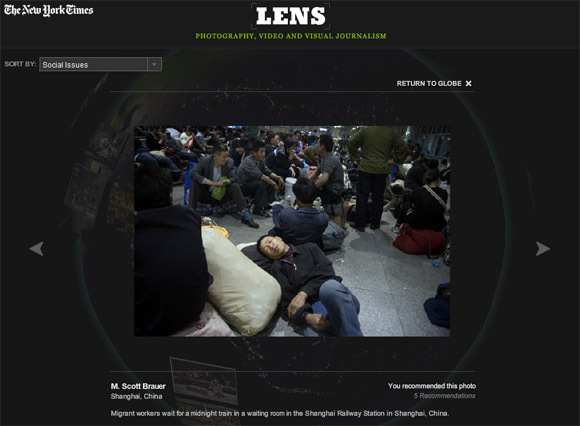 Migrant workers sleep while waiting for a train at the Shanghai Railway Station in Shanghai, China. The New York Time’s Moment in Time project launched today, and my contribution is one of the few from Asia in the Social Issues category. The project asked people around the globe to capture what was happening around them on May 2, 2010, at 1500 UTC, or 11pm in China. I was in Shanghai at the appointed moment, en route home after a shoot in South Korea, and found a couple of interesting subjects before I boarded a train.